European Union’s renewable energy obligations which aim to have 20% of Europe’s energy generated from renewable sources by 2020. The UK is committed to help achieve this ambitious target. Solar is a great natural resource that until now has been underutilised in Scotland. They have been operating successfully across Europe for a number of years now and carry the major benefit compared to other forms of energy generation of extremely low impact on the local area. 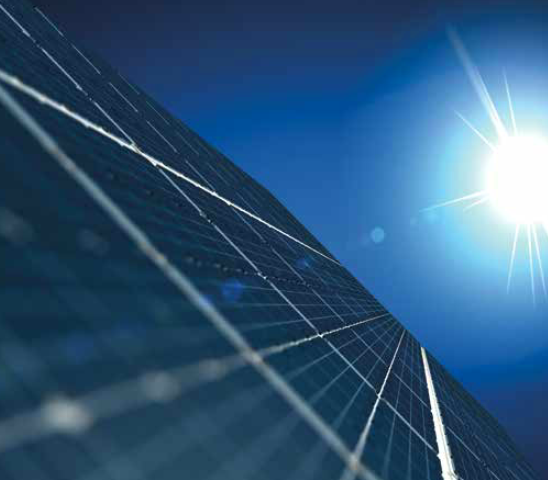 Solar photovoltaic panels convert sunlight to electricity. The sun’s rays, light particles known as photons, produce an electrical current as they strike the surface of thin silicon wafers. Each solar panel has around 36 individual cells wired in series producing around 12 volts. The photovoltaic panels are a collection of wafer thin silicone cells laminated together and placed onto a substrate, covered with protective glass and inserted into an aluminium frame to form a single photovoltaic module. The photovoltaic cells are coated with two semiconductor materials, one of which has a positive charge and the other, a negative charge. When exposed to sunlight some of the light particles or photons are absorbed by the negative semiconductor atoms, which in turn frees electrons to flow back to the positive semiconductor. This flow of electrons is called direct current (DC). The individual solar cells are then connected in series strings to build voltage and the strings are connected in parallel to build current. This is why the panels are arranged in long rows running across a field, to make this process as efficient as possible.